The Frankfurt SEO Expert takes any page and ranks it in Google. The optimization drives quality visitors, triggers organic conversions, and maximizes brand visibility. Ted Politidis, SEO Expert and Coach; Ranks in Germany, the USA, the UK, Canada, and Australia for SEO terms; Masters Degree; 10+ years in Digital Marketing; Google Certified Partner; SEO Certified by the University of California, Davis. Give me a few weeks to bring you to the first page. Give me up to six months to rank more terms on the board. Join in and see what my services include. My unique strategy profits from ten years SEO experience working on-page and off-page. There is no use to run behind buying backlinks, building PBNs, or doing article marketing. I provide quality traffic from Google Search, Google Maps, YouTube, and other platforms. I want to boost lead generation and increase conversions. It looks to me that you haven't exploited the free traffic source yet. Hire a consultant who knows what he's doing. Not all SEO consultants master the knowledge to rank a site and will waste your time and money. The real power of SEO is in coding and the massive traffic it provides. It takes longer to build up SEO traffic, but it is cheaper than other channels. Not all niches offer the same timeline or opportunities as they need more work. In those cases, you need to consider higher costs and longer timescales. Step one is to increase your page visibility, meaning more search terms in top positions. Step two is to boost SEO conversions and increase time-on-site (low Bounce Rate). I mean search clicks on your titles and descriptions. Optimization works with content, no artificial tactics, no backlinks. Anything that breaks SEO is out of my strategy. I bring your solutions to people via online platforms and generate traffic and leads. Everything's manual, no automation software. The emphasis is on human clicks. Another benefit is that my pages run no with Google updates. Go ahead and jump on board today. 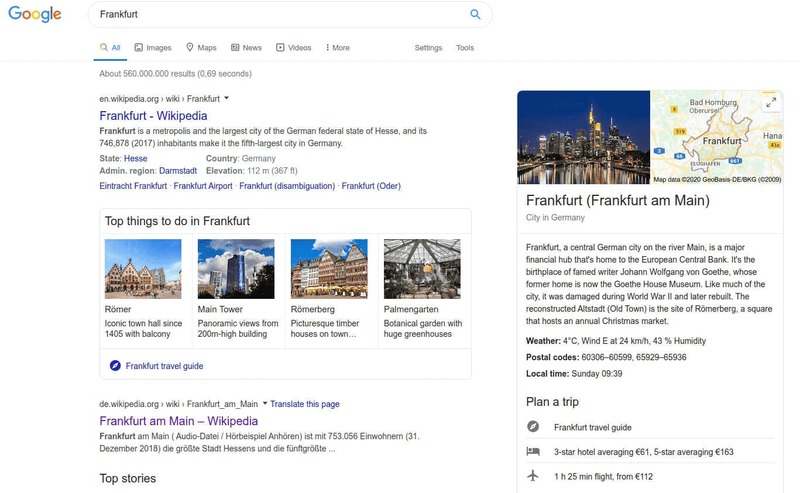 Get yourself the best search spots and quality traffic in Frankfurt. Use my unique SEO strategy to grow any page, in any niche. Hire an apt consultant and find out how the results make you happy. Search Engine Optimization, Landing Page Optimization, Google Ads (Paid Search), Social Media Marketing, Mobile Marketing, YouTube Marketing (Video Optimization), Negative SEO Monitoring. Niche-specific: Video SEO, Mobile SEO, Travel SEO, Legal SEO, Medical SEO, Real Estate SEO, and any other niche. Berlin -- Bielefeld -- Bremen -- Bochum -- Bonn -- Cologne -- Darmstadt -- Dortmund -- Dresden -- Düsseldorf -- Duisburg -- Essen -- Frankfurt am Main -- Hamburg -- Hanover -- Kiel -- Karlsruhe -- Leipzig -- Mannheim -- Munich -- Münster -- Nuremberg -- Offenbach -- Regensburg -- Stuttgart -- Wiesbaden -- Wuppertal.